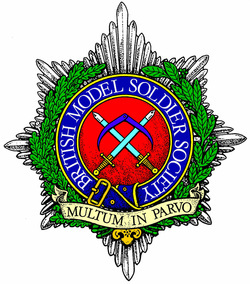 Welcome to the home page of the British Model Soldier Society (BMSS), the largest and longest established association of model soldier enthusiasts. The BMSS includes enthusiasts for all types of model soldiers of any scale or period and welcomes members from all parts of the UK and overseas. This year's BMSS Annual Show will be on Saturday 27 April 2019, at St Saviour's Church Hall, Lupus Street, Pimlico, London. Put the date in your calendars now, as it is an event not to be missed! For more details please see the Annual Show page. The 2018 BMSS Annual Show was held on Saturday 28 April 2018, and was a great success with the halls buzzing throughout the day. Left: "Spanish Guerrilla Officer, 1813", by Jon Page, in the Competitions Class 1. Centre top: "Royal Naval Landing Party, Zulu War", by Tim Hyndman, in Class 7. Centre bottom: “Gassed”, by Kevin Jarratt, in Class 5. Right: "Ensign for the Colour, Coldstream Guards", by Mike Williamson, in Class 8. For more photos from the 2018 BMSS Show, see our Annual Show page. For the very latest News of events, what's happening in the Society, visit The Blog page! If You would like to leave a comment, please feel free!